I’m a big fan of British pubs and think that everyone who visits England should spend some time relaxing in one with a beer. But when you are traveling as a family it can be tricky to find a pub that is both appropriate for children (they are bars after all) and that serves decent food to accompany those pints. I was happy last summer to discover The Chandos, which is a great place to both enjoy a drink and eat out with kids in London. We ate at The Chandos because it was the recommended lunch stop on our Fat Tire Bike Tour. There are a couple of reasons I liked it. 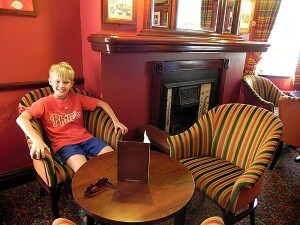 It is cool and clean and the upstairs lounge is charmingly furnished with comfortable chairs and a fireplace. Signed photographs from the actors who frequent the bar after their shows at the nearby Garrick and Duke of York theatres decorate the walls. The service is efficient and friendly. And the food is reasonably priced and tastes just fine. This may not sound like a ringing endorsement, but let me just say this: Matt and I have eaten pub food that literally made us gag, so any place that can serve decent fish and chips, bangers and mash, hamburgers, or cheese sandwiches with chutney as the Chandos does are aces in our book. Unless a pub is noted for its food (part of the so-called “gastro-pub” phenomenon), eating in London is always a bit of a risk. The Chandos offers a way for families to have a typical English pub experience without fear of being served greasy mystery meat. And of course, you can enjoy a delicious beer. 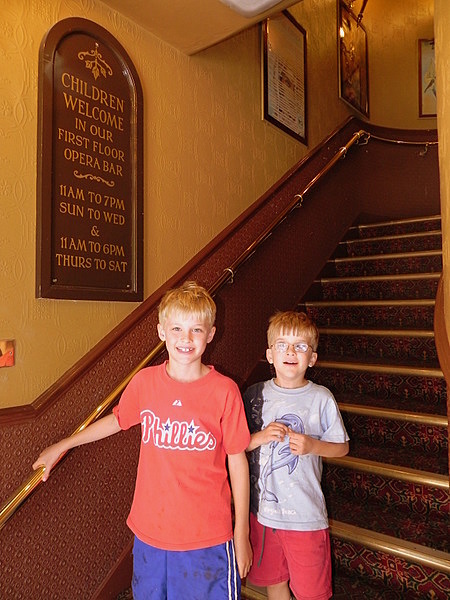 As a sign on the stairs says, the Chandos explicitly welcomes children (not all pubs do – even those that serve food) and this makes it the perfect place for families to enjoy a quick bite at lunch or dinner. You really can’t beat the location either, on the northeast corner of Trafalgar Square, right across the street from the National Portrait Gallery and Saint Martin in the Fields. It’s close to the theatre district, Covent Garden, and any number of Central London attractions. There are many, many tourist traps in this part of the city, so I’m always happy when I find a place that has some charm and where I can rely on the food to be decent and affordable. Interested in my other central London restaurant recommendations? See what I have to say about Wagamama and Belgo Centraal. And be sure to check out Wanderfood Wednesday at Wanderlust and Lipstick for lots of other intrepid food finds. During my first visit to London (also my first trip abroad) I was shocked to learn that there were restaurants that did not welcome children. I understand the concept now, but that first time I walked into a pub and was asked to leave because of the kids was a culture shock I’ll always remember. This is a great find, especially for traveling families. Thanks for sharing! Good tip! You’re so right – family friendly food is not so easy to find in London! 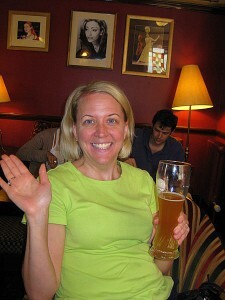 Thanks to your recommendation [and Rick Steves’] we ate at the Chandos with our teens last summer and loved it! We sat upstairs and had a wonderful lunch — fish and chips, shrimp and I think my husband had some sort of beef pie. It was delicious and the atmosphere was most charming! It’s always great to find a pub which welcomes children. I’ve even been to a few which provide toys and games!